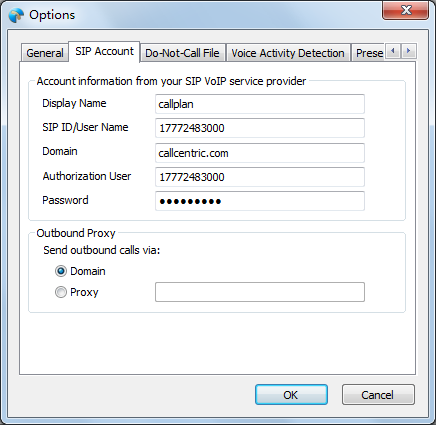 What do I need to run Ecsow Dialer for Skype & SIP? 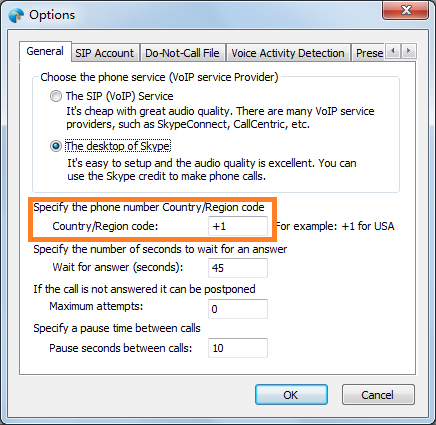 Where to set up country code/ region code in Ecsow Dialer for Skype & SIP? What can an agent do when a call is connected? Could you provide an details(CSV file sample) about the format of the CSV file? What happens when Ecsow Dialer connects with a live person? What is VoIP Service Provider? Ecsow Dialer says "The Skype rejected Ecsow to access it..."? 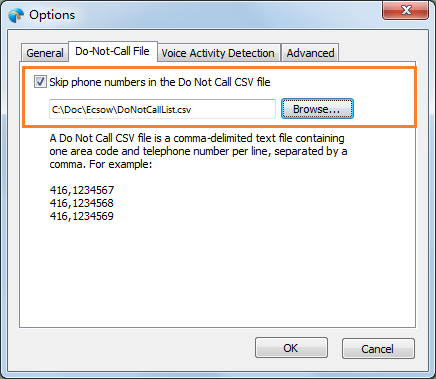 How to set voice activity detection (VAD)/speech detection in Ecsow Dialer? 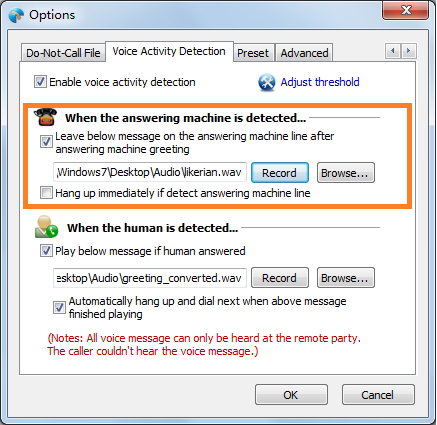 How to set automatically leave a message on the answering machine line? How to set automatically record campaigns? How to set preset notes for campaigns? How to set Do Not Call list for the campaign? How to put Skype in silent mode? How to import CSV campaign file? How to specify the corresponding relation when I import the CSV file? 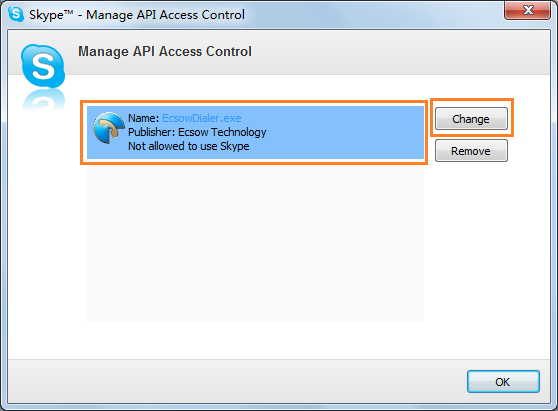 How to set up Caller ID for Skype? How to config SkypeConnect at Ecsow Dialer? How to config SIP Trunk at Ecsow Dailer? How to Setup a Voice Broadcast System? 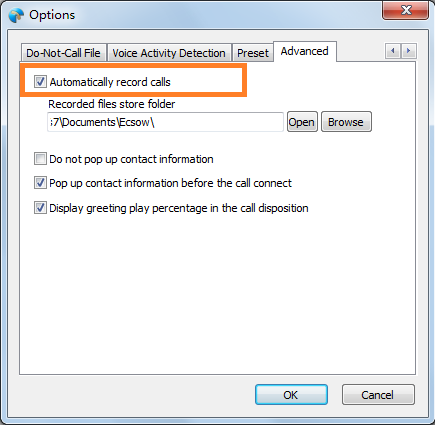 How to Setup Voice Broadcast Call Transfers (Press-1 to transfer)? How to setup Call Back? How to record voice greeting file? 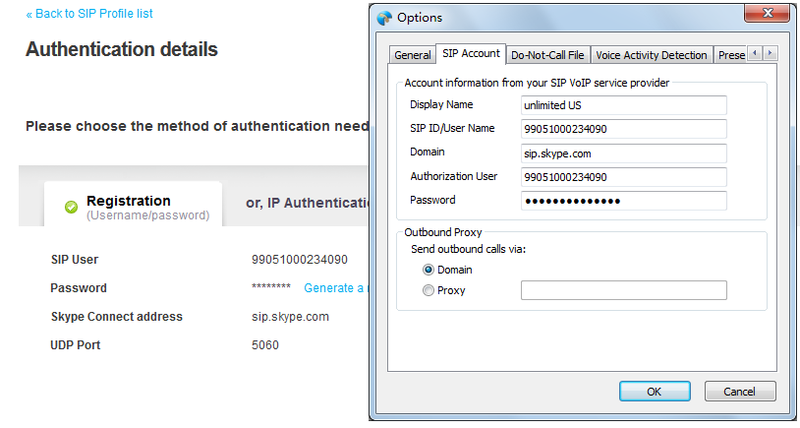 Ecsow Dialer for Skype & SIP is a software only solution. You do not need any special hardware. Basically, all you need is a computer with Skype installed or other VoIP Services (Such as SkypeConnect, Vonage, CallCentric and so on). The agent can press 'Play Msg' button to play a pre-recorded audio message. The agent can enter call notes, edit call information. 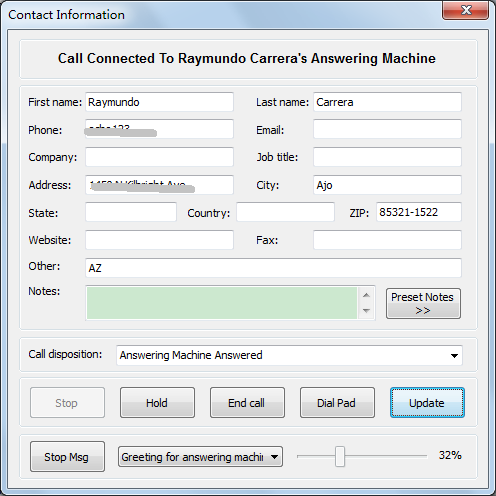 A screen popup with information about the call is displayed on the agent's computer. 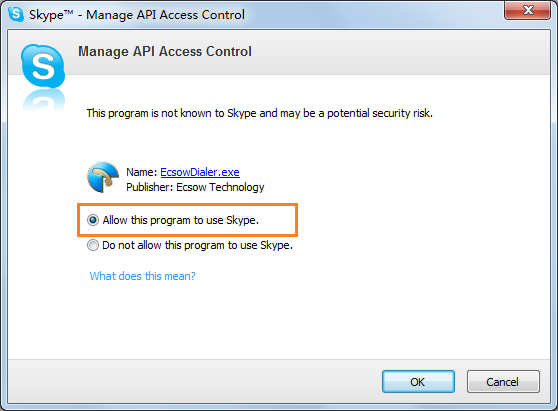 That because Ecsow Dialer is not allowed to access Skype due to a previous wrong answer to the access control question from Skype. 1. Open Skype and click on menu "Tools->Options". Click on "Advanced". 2. At the bottom of this page click on "Manage other programs' access to Skype". 3. A window will open. It should show an entry called "EcsowDialer.exe" but also may contain other programs. Click on EcsowDialer.exe and click the "Change" button. 4. You should see the window below. 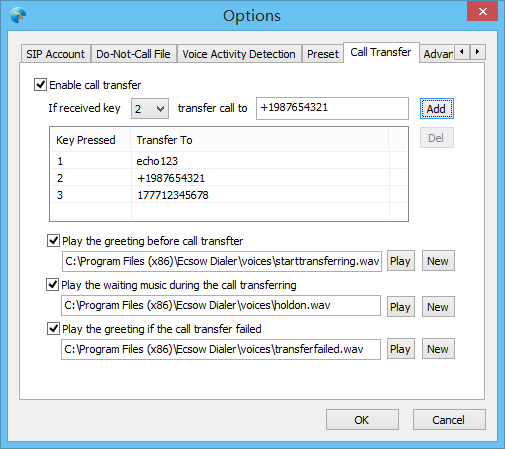 Select the top entry, this will allow EcsowDialer.exe to always to use Skype. 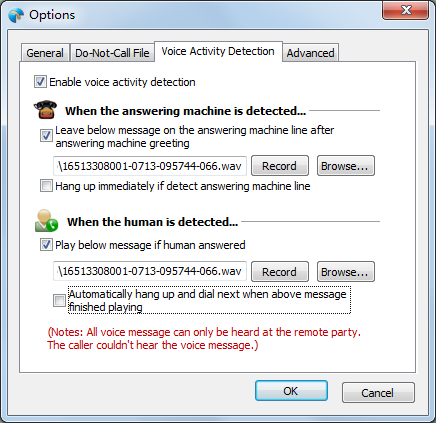 Please set it from the 'Voice Activity Detection' tab under Ecsow Skype Dialer Options. You can enable/disable voice activity detection option. 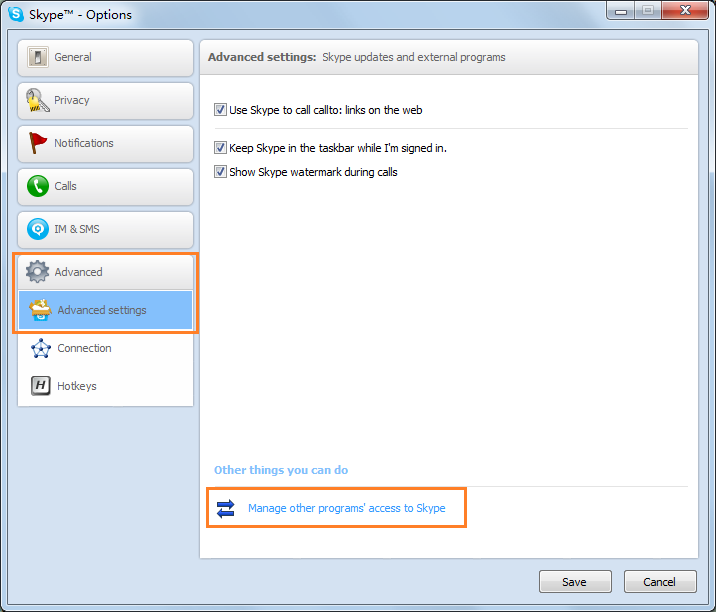 Please set it from the 'Advanced' tab under Ecsow Skype Dialer Options. Please set it from the 'Advanced' tab under Ecsow Skype Dialer Options. Please select the 'Set preset notes(separate with semicolons if more)' otion and enter your notes. Please set it from the 'Do-Not-Call File' tab under Ecsow Skype Dialer Options. 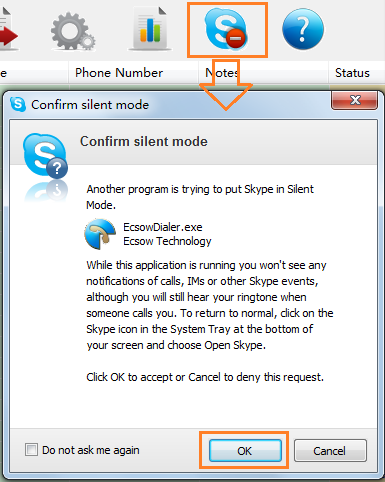 Click the 'Silent mode' button to put Skype in silent mode that shown as below. Click the 'Import...' button and select the 'Import CSV file' that shown as below. If you don't know how to create the CSV (Comma delimited) file, please see How to export Excel data to CSV files in Excel? Please download the CSV format sample file from sample 1 / sample 2 / sample 3. Please click here to set up Caller ID for your Skype calls. Please specify the column index when you import the CSV file as below. 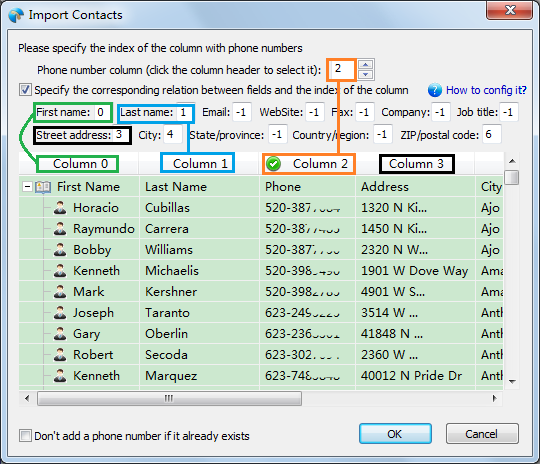 You can click the index of column header to specify the phone number column. The other fields should manually input the index of the column to specify the corresponding relation. VoIP stands for "Voice over Internet Protocol", which is a technology that allows you to make phone calls using your Internet connection instead of your regular phone service. The only requirement for this technology is a high speed Internet access. To start your broadcast campaign with Auto Dialer you need to have an account credentials for a VoIP service provider. Click here to see what is Skype Connect™ and how does it work? If you are wanting to setup a telephone voice broadcast system - now it's easier than ever. Please go to the Ecsow menu Tools > Options > Voice Activity Detection tab. 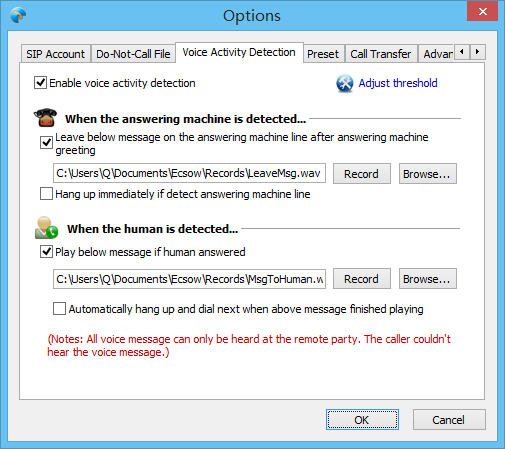 2, Enable the "Play below message if human detected" option and record a message for it. And click the "OK" button to apply the settings. Now, you can click the "Start dialing" button to start your voice broadcast. It's very easy if you want to transfer caller from a voice broadcast to your sales team, support, or call center. Please go to the Ecsow menu Tools > Options > Call Transfer tab. 1, If you use the desktop of Skype as your phone service, you can specify a Skype user account or a phone number(For example:+1987654321 the country code +1 should be added.). It's very easy. You just need to click the "Call Back" button from the contact information dialog to schedule the call back time and information. Please click Ecsow menu "Tools" > "Record Voice Greeting File" to run the Wave Studio. Click the "New" button/menu or "Record" button from the Wave Studio to start recording your voice greeting file.